If I am in our town centre I can’t resist a browse in our branch of Poundland, which is huge and has a surprising number of interesting new products. I scan the shelves for anything with a “new” label and hope to pick up some interesting Foodstuff Finds. These Paprika Smiths Crisps crisps caught my eye, despite the fact they do not have a “new” label, but I knew I hadn’t tried them before and I know that I spend a lot of time scanning shelves of crisps! At the very least they are new to me, so I picked up a multipack. Okay I admit it, I also did a quick Google to make sure we hadn’t already reviewed them, my memory is not an impressive thing. 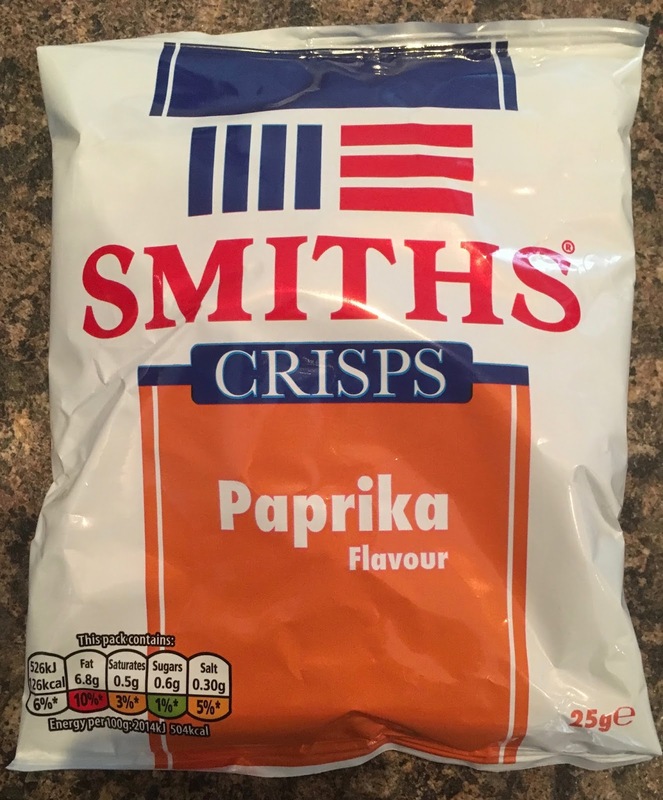 I had my first bag of these Paprika Smiths Crisps with some lunch and poured them out onto the plate. They had a deep orange colour from the seasoning and looked like they may be quite strong. I tried one and found them to be actually rather mild. The paprika was present, but it was a gentle hint, complementing the flavour of the potato like salt and a hint of warmth. These were very easy to eat, and the paprika in them worked wonderfully, even if it was at the milder end of the spectrum. 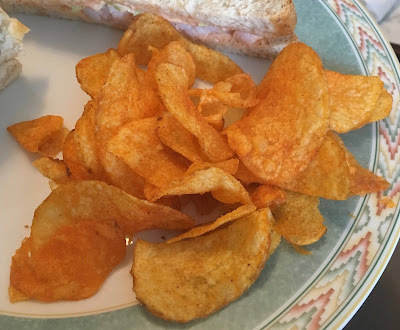 As the crisps are Smiths they are light and crunchy and easy to eat. I shall look forward to having these in my lunch box over the next week or so. While at the station I noticed these fun little ‘good shot’ drinks in Marks & Spencer’s, but as I wanted a big drink and was off out I just lined them up for a photo and moved on. The kale looks like it had sold out! A couple of days later and one of my work buddies had picked me up the oddest of the bunch. And it’s basically 95% apple juice, 2% lemon juice, 2% yuzu juice and some charcoal. Which is all very nice, but it’s just 100ml of apple juice for £1.50 really. Okay, so I'm not well. Unfortunately I have a bit of food poisoning or I've picked up a bug from somewhere and suffice to say without too much gory detail; things are pretty rapid in the gravity department. 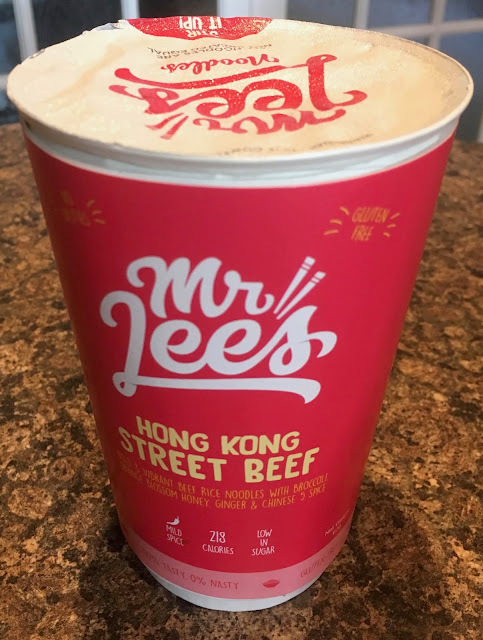 So I thought I'd try Mr Lee's Hong Kong Street Beef noodle pot. Damien Lee created Mr Lee's noodles after he'd been diagnosed with cancer and wanted to produce food that is good for people without the 'nasties'. So I have my fingers crossed for my grumpy belly. The pot says it has a mild spice, but it has ginger in it, which is good for my poorly tummy, as well beef, noodles, orange blossom honey, which sounds delightful, and Chinese Five Spice. On opening the pot there was some dried beef and other ingredients mixed at the top next to the dried stringy noodles. I boiled the kettle and added freshly boiled water. After replacing the lid for three minutes, I gave the pot a good stir. It smelt great, there were chunks of beef floating around amongst the noodles as well as diced vegetables and spices (see photograph). 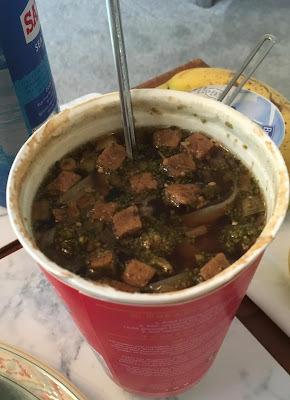 It essentially looked like beef in gravy with noodles in a cardboard pot, which I guess is what it's supposed to be. 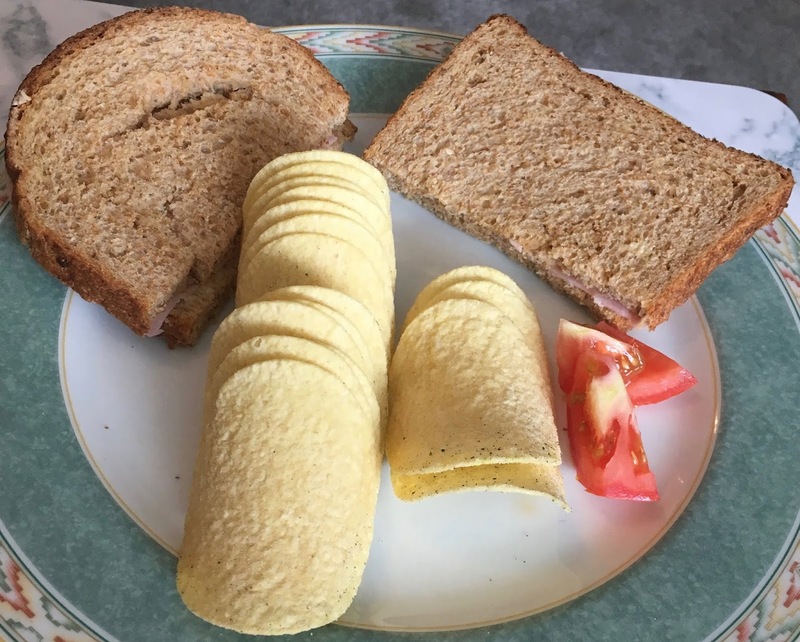 I had a couple of pieces of bread to dip and some boiled eggs on the side. On taste this Hong Kong Street Beef tasted like beef in a lightly spiced gravy. It was a hearty warm treat for my poorly tummy and went well for dipping due to a large amount of liquid, and not too messy on my chin from eating the noodles with a fork. I also had some fruit and a yoghurt to finish off with, washed down with a mint green tea and also a ginger beer. All for good for a bad stomach or tasty treat any other time. The 422g pot (once rehydrated) has 218 calories, with 1.8g of fat, 2.6g of sugar, and 1g of sodium (salt). Please see photograph for ingredients. The latest addition to the grab bag market are some new chocolates from Galaxy, called Chocolate Creme Wafer Curls. 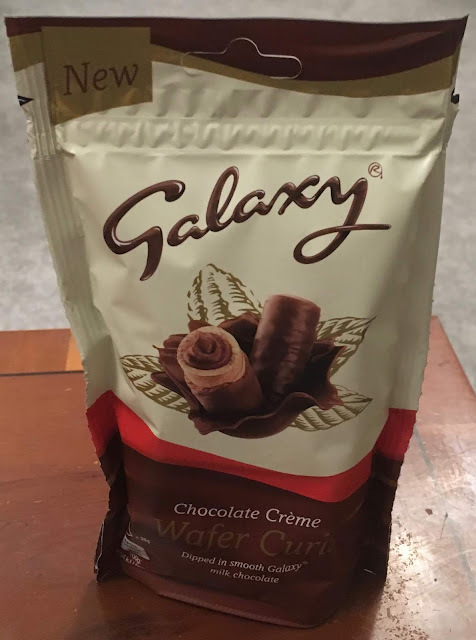 I can’t remember seeing any Galaxy chocolate products in this format before, and I was pleased to see that this is a whole new product too, not just something repackaged. 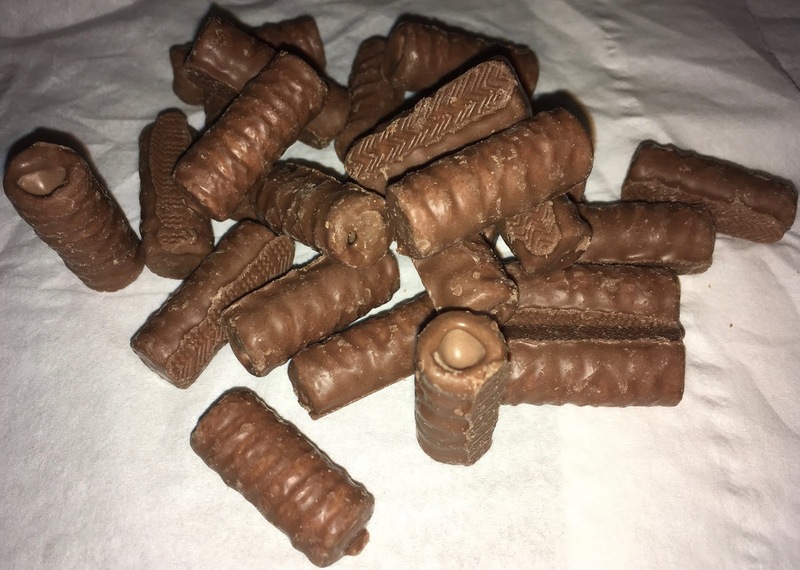 Galaxy Chocolate Creme Wafer Curls consist of a twist of wafer, dipped in Galaxy milk chocolate and filled with a smooth chocolate filling. There are some filled with hazelnut creme also available, and I will be looking to pick these up too. 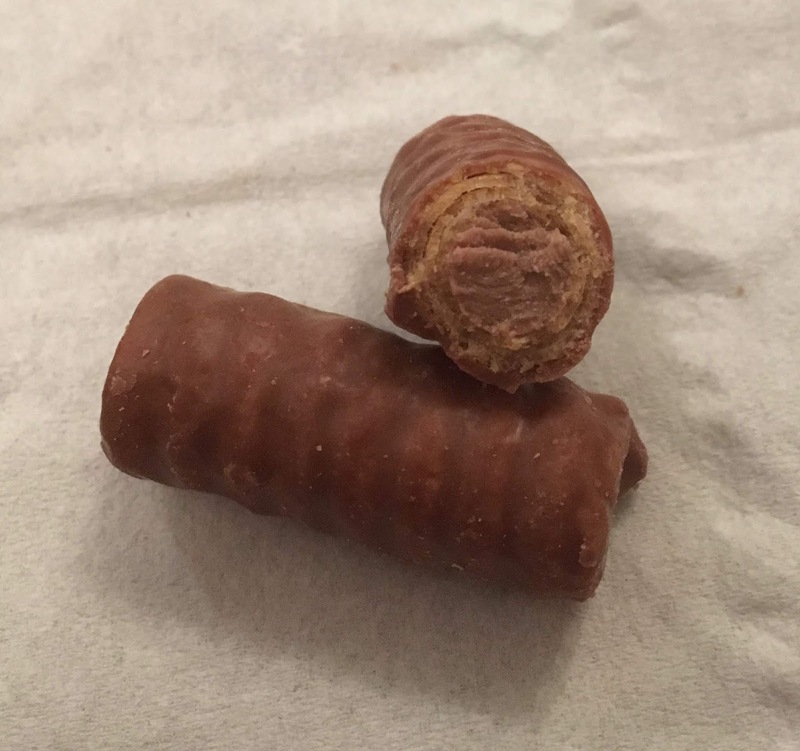 There are quite a few Galaxy Chocolate Creme Wafer Curls in the bag and the coating of chocolate on them looked quite thick. I tried one and loved the mix of textures, they are light and crispy, and very easy to munch on. The smoothness of the Galaxy chocolate shines through, and these are sweet and very creamy. The filling adds an extra hit of chocolate, and each one of these are divine. Galaxy chocolate is so smooth, these are a lovely burst of rich chocolate flavours. As someone who loves interesting texture I found myself enjoying the wafer crunch and how it melts down to nothing. The biggest problem with these chocolate is the idea you are supposed to share them, they are so easy to eat I was just watching the bag disappear. Sweet, creamy, crispy, chocolatey goodness. It has been a while since our last visit to KFC, and as it is a Bank Holiday weekend we thought we would treat ourselves to lunch out. Naturally I scoured the menu on the wall for the magic “new” word, and I was greeted with the discovery of Southern Bites. 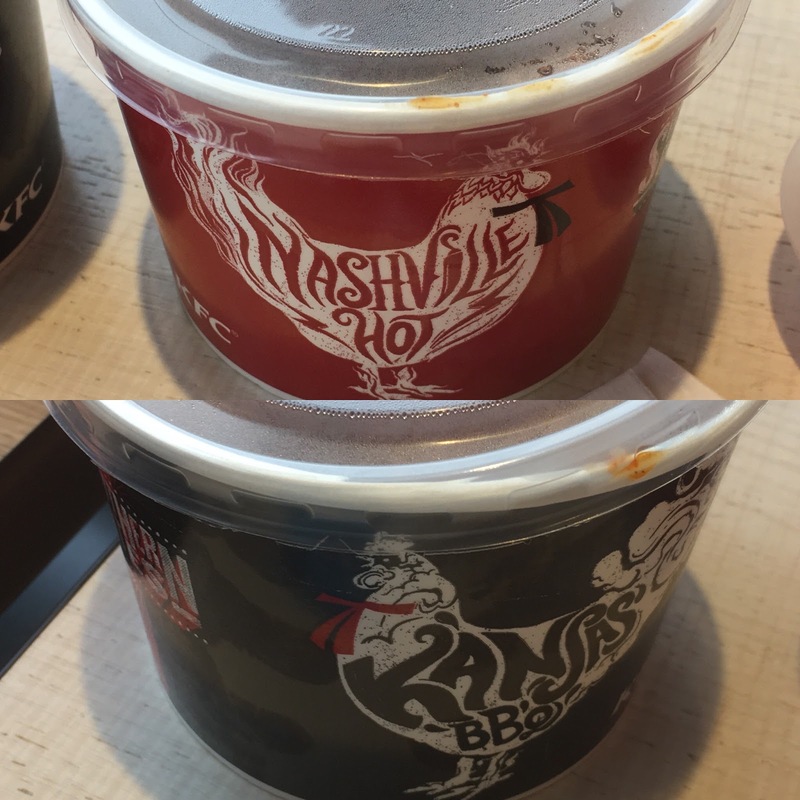 They come in two flavours; Kansas BBQ and Nashville Hot Southern Bites and we ordered a pot of both as an extra to our meals. KFC meals are not really small enough to require an additional element, but in the name of blogging and taste testing we felt obliged. Inside each tub are four chicken bites covered in sauce. You will definitely need the wet hand wipes after eating these! 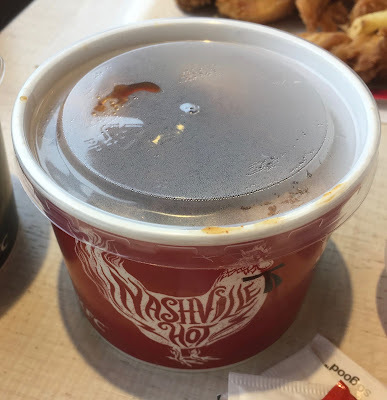 We started by trying the Nashville Hot Southern Bites, with their orange red sauce. 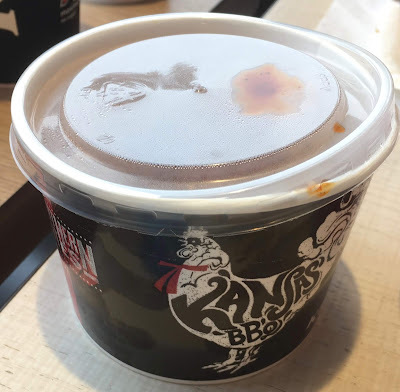 My first thought was that maybe I had got the tubs the wrong way round and that these were the barbecue flavoured ones. They did have a kick of heat, but they were more medium that hot, but the spices in the sauce were divine. They did taste a little sweet, with chilli and very well seasoned in a way I thought was barbecue style. I liked them, I think some would prefer them hotter. 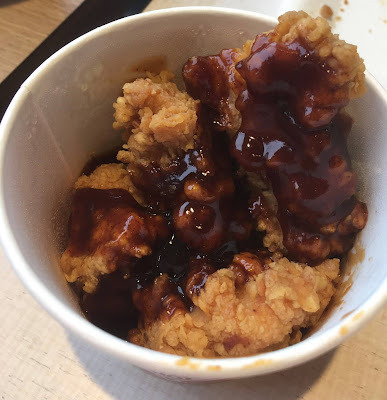 Next up we tried the Kansas BBQ Southern Bites, which had a dark brown sauce on the chicken. Okay these are definitely barbecue, they are well spiced, but the rich smoky flavour is unmistakable. They don’t have much heat to them, but the sweet barbecue flavour was a pleasure to eat, and went very well with the chicken. 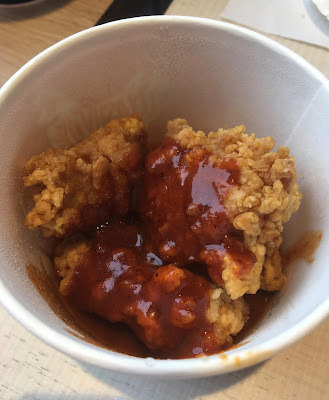 I loved both of these new varieties of Southern Bites from KFC, and found myself enjoying the hot ones more than expected. I think this means they are probably not hot enough really, but they worked well for me. The barbecue were spot on, and both flavours make a nice addition to a treat meal from KFC. Cinabar reviewed the BBQ flavour of these back in July, but I'd not actually seen them in the wild until this weekend. The basic premise is similar to those lovely crisps you get in Europe where there a big crunchy mass of flavour. These are similar and surprisingly there were no broken ones in the bag! We went for the veggie friendly Sweet Chilli flavour and had them with our lunches too. This is my partners lunch - a plate full of olives wasn't quite as photogenic. And my verdict is they are fine. I genuinely couldn't have told you what the flavour was in a blind test. There is a mild chilli hit, but nothing really like the gourmet crisps. Maybe it's something to do with the textures involved? I'd rather have the real, cheap waffle crisps or regular potato crisps than these, but they are a pleasant diversion and brilliant for a sharing side. Grab a bag while the special offers are on and see what you think. I couldn't find an explanation as to why the can is covered with balloon skulls, and what looks like a long haired Grim Reaper harvesting more skulls to create a skull pyramid! 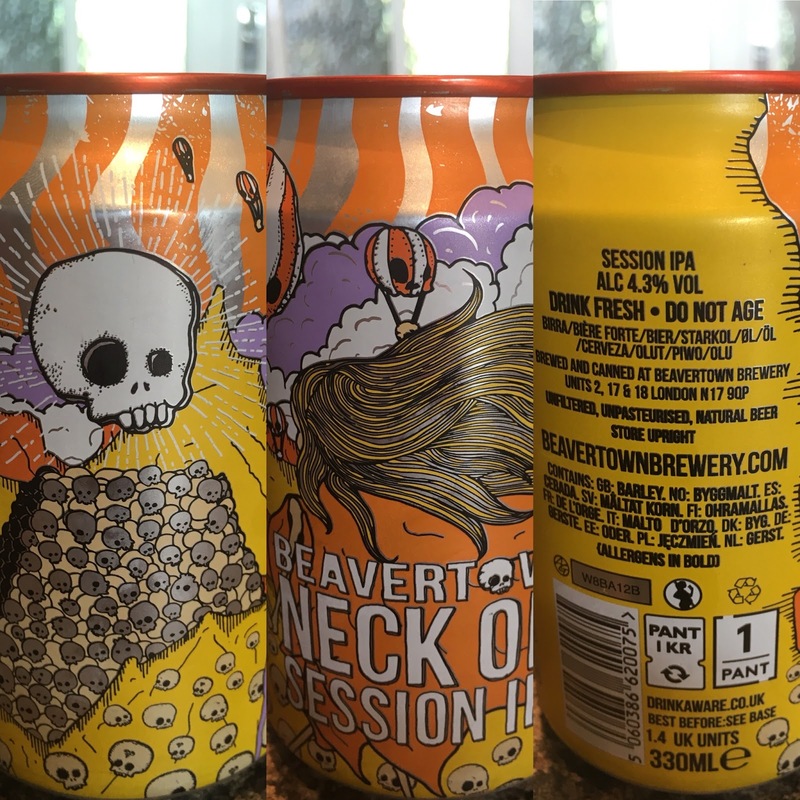 Produced by Beavertown this Neck Oil Session IPA was created as a light crispy summer India Pale Ale. 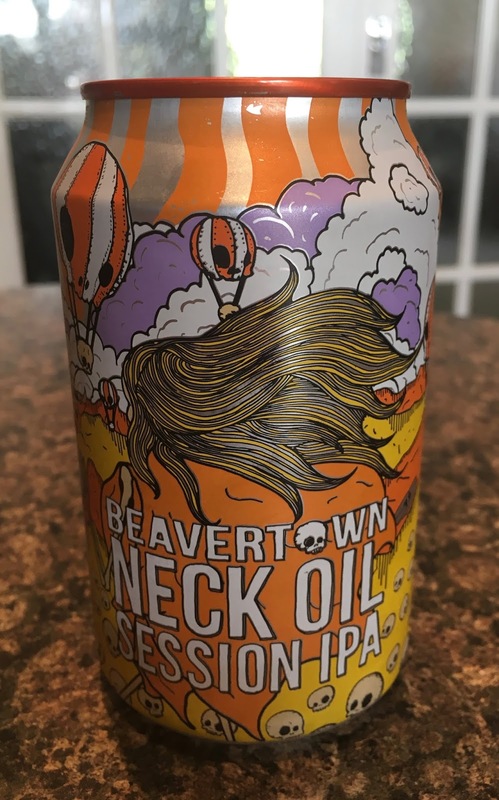 Possibly called 'Session' because of its low alcohol volume of 4.3%, Extra Pale and Carapils malts were used in the brewing mixed with multitude of hops; Columbus, Centennial, Simcoe, Amarillo, Galaxy, Vic Secret, Mosaic. 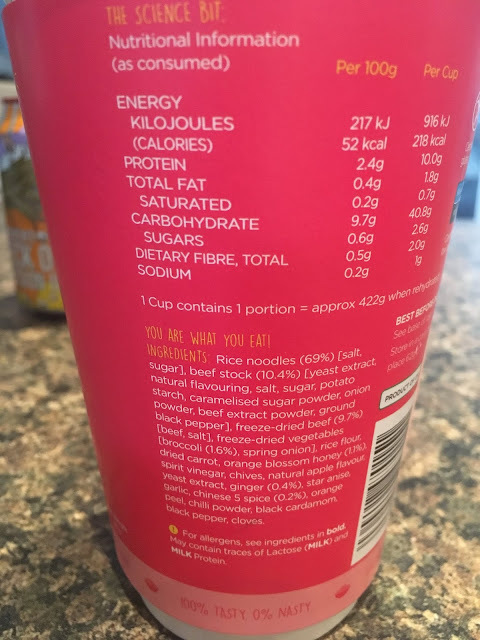 Wow that's quite a lot of flavour in one small can! On opening the can there was quite an aromatic blast of herbal hops to start with, followed by citrus hops and pale malt in the background. I was a little worried this IPA would be overbalanced by the sheer amount of hops literally bursting out of the can. On first taste there was the herbal hops with some light citrus flavours balancing out the bitterness followed by sweet pale malt. I was a little relieved about the balancing out of flavours of this tasty refreshing IPA. This is a really lovely light and crispy bitter craft ale, perfect for warm summer evenings spent in the garden watching the sun going down, rather than the skull balloons going up! 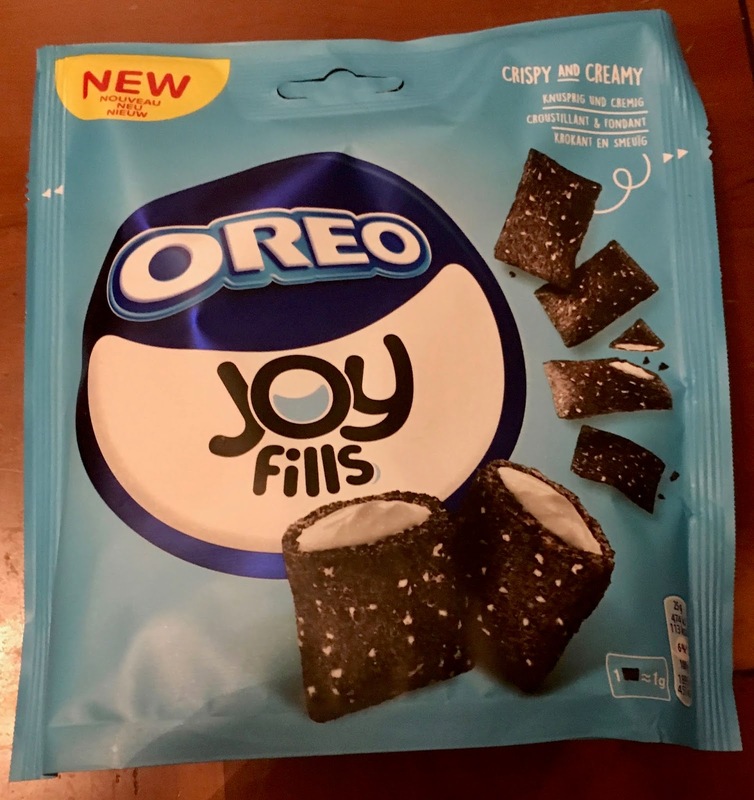 The latest addition to the grab bag market are from Oreo and are called Oreo Joy Fills. I have to be careful at this point not to say that the contents are chocolates or biscuits because they are actually something different, not your usual grab bag contents at all. Inside the bag are quite a few dark wheat shells which are filled with Oreo style white “stuff” filling. They are not quite as filled as the image on the pack made me think they would be. I also have to be careful not to say breakfast cereal, which is the closest thing I could think of to describe them. The pillow shaped shells are quite dark and aren’t speckled with white as much as the packaging implied either, but they are filled with some white crème. I gave one a try, and checked the back of the pack, no I’m definitely not supposed to add milk but they do taste like a breakfast cereal. These remind me of eating cereal straight from the box when I was kid, it was a naughty snack, and usually meant we had run out of crisps. 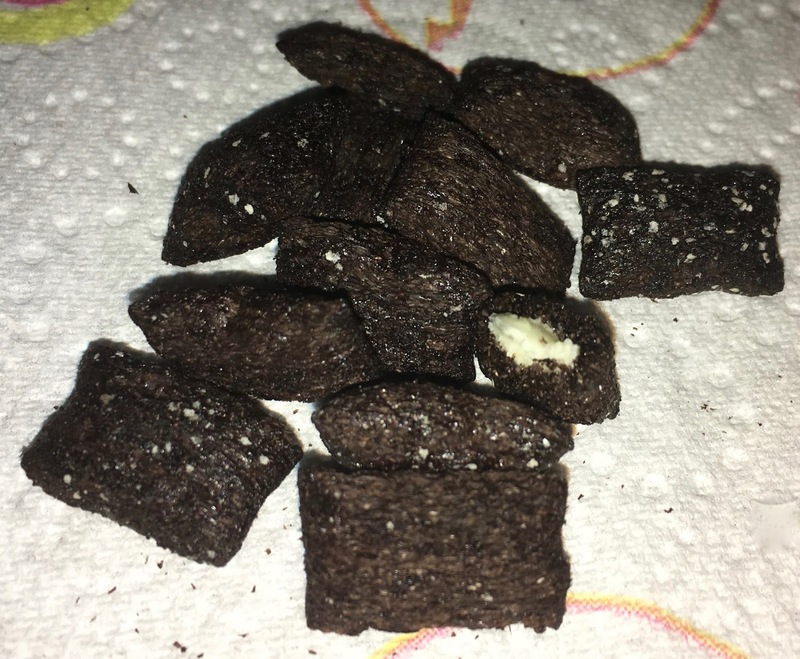 I was finding it hard to put away thoughts of breakfast, but I did actually like these New Oreo Joy Fills. The shell is crunchy, and the centre very light and soft, they deliver a pleasing bite of chocolate flavour and crunchy mix of textures. They are a little too easy to eat though, and although there aren’t that many calories in a portion, the speed I found myself munching through them I soon realised my sugar intake was beginning to grow. Occasionally the wholesalers my cornershop uses has some good Euro snacks that they decide to pick up. They now stock Knoppers as standard (probably due to the amount I buy) and occasionally get the Bahlsen range in. I’d not seen these little waffles or Waffeletten before so naturally had to try. ...and here they are! They are a little less pretty than the box, and quite fragile so very well packed. They are however little taste explosions! The bit without the chocolate is for holding on to, and while you’ll try to eat them in two bites you’ll end up going in for the whole thing as it crumbles all over. Still a little expensive for what you get even at the introductory price, but a lovely little treat to share with friends. I don’t often have breakfast type bars. In fact I’m not actually going to eat it for breakfast, but pudding after my rather extensive packed lunch at work. I can’t particularly eat overly sweet things for breakfast like chocolate. I usually have some of a mini banana, mainly because our bananas often look sat on when they arrive from the shop. So I cut the bruises out whilst eating them, but also in the recent heat they’ve gone overripe too quickly. Too overripe a banana and I may feel a little off colour when eating it. However, I can eat a full English breakfast first thing in the morning, just not something too sweet… which doesn’t make much sense to me, but there you go! This Salted Caramel Honeycomb Bar is made with honey covered in a caramel flavour and then coated with Belgian Milk Chocolate. If that’s not an over sweet combination, I can’t think of another. 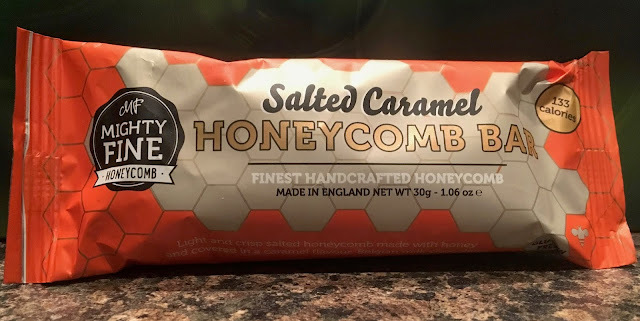 So I’m going to eat this Salted Caramel Honeycomb Bar, produced by Mighty Fine Kitchen, a little after lunch, when I usually have a chocolate bar to snack on. From the smell of this Salted Caramel Honeycomb Bar on opening I immediately started to wish it was Friday (in order to thank it…), rather than Monday (on writing this blog), but I wish it was Friday every Monday (asides Bank Holidays), so not much difference there! This bar did taste like a high-end Crunchie Bar though. It was sweeter with a touch of caramel, even crunchier, and covered with the most luscious Belgian Milk Chocolate. To me the wrapper makes this bar look and sound like a breakfast bar, but it’s definitely an all-day everyday kind of chocolate bar. From a Foodstuffs-fight point of view for sheer indulgence, luxury and less calories this Salted Caramel Honeycomb Bar would likely win, but for convenience, for the slightly bigger bar and the equally excellent quality Cadbury’s Milk Chocolate you may wish to still thank Crunchie it’s Friday! The 30g bar contains 133 calories, with 2.3g of fat, 20.5g of sugar, and 0.19g of salt. Ingredients are gluten free and contain; Honeycomb (61%): sugar, glucose syrup, honey (4%); Raising agent: sodium bicarbonate, salt, rice flour; Milk chocolate (39%): sugar, cocoa butter, whole milk powder, cocoa mass. Emulsifier: soya lecithin; natural Flavouring and vanilla flavouring. 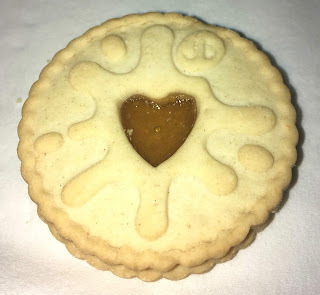 Jammie Dodgers are probably one of the most iconic British biscuits. They have been going a very long time and are a firm favourite on shelves. They consist of two layers of biscuit with jam sandwiched in between. Just occasionally, and it is occasional, we get a limited edition new flavour or variant. 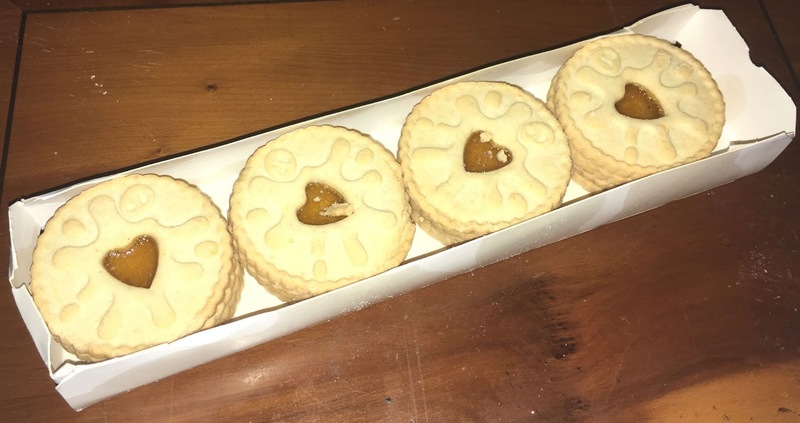 As it is summer they have come up with a refreshing sounding Lemon Twist versions of the Jammie Dodgers. The packet is very bright even by my standards, and I love colour. It would have seriously stood out on the shelves, but to be fair I bought them online and hadn’t really spotted how pretty the pack was until it arrived. Inside are 8 biscuits, with a yellow jam centre showing through the distinctive heart shape on the top side. I gave one a try and despite hopes of an ultra zingy flavour, based on the seriously bright packaging, it had a mild sweet lemon taste. The lemon flavour worked well enough with the biscuit base, they were sweet and pleasant enough. I would have preferred a stronger sharper lemon flavour, one that stood out a bit more. They were nice, but not something I will pine when the Limited Edition comes to an end. If truth be told and I was in the shop looking at the biscuit shelves staring at these or the original, it would be the original ones I’d be popping into my basket. I know it is August and it might not be everyone’s favourite time for a warming mug of hot chocolate yet. The weather has turned a little though with autumn around the corner, but frankly hot chocolate should just be for whenever you fancy a mug, without justification needed. 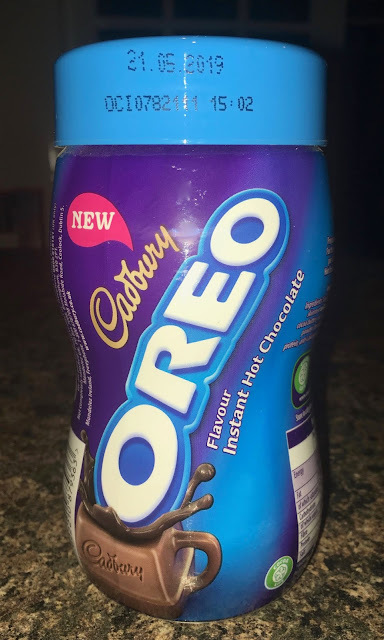 There are new hot chocolates launching and the first one to catch my eye was this new Oreo Instant Hot Chocolate. As per the instructions I put the kettle on and added four heaped teaspoons of Oreo hot chocolate powder to two mugs. I looked in the smallish jar and realised I’d used quite a large proportion of the contents. I think it dawned on me it wouldn’t make that many mugs in total, or I had totally overestimated what a heaped teaspoon was. On the bright side the powder dissolved really easily when the hot water was added, and there were no lumps. It was dark in colour though, this was either because Oreo biscuits are dark, or because I had indeed used too much. I gave the drink a sip and although it was nice, it wasn’t very strong. 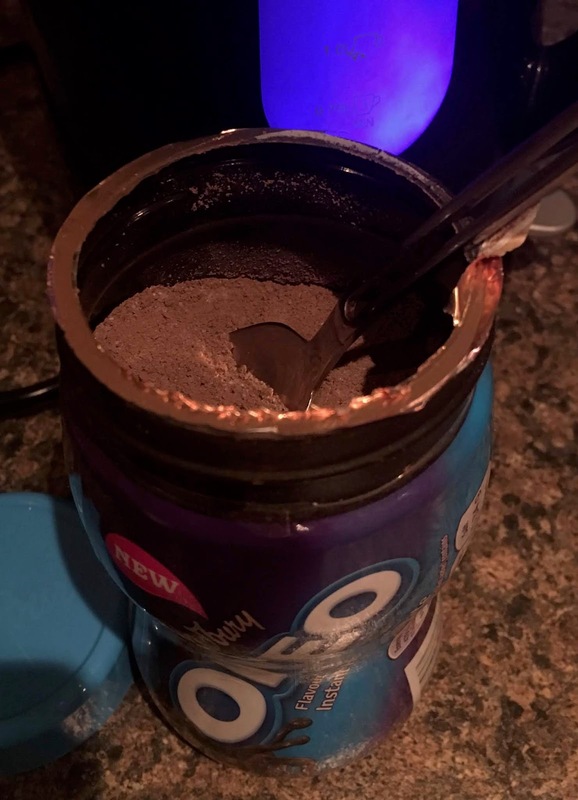 The drink tasted more like a regular hot chocolate than I had expected, the Oreo was just a subtle hint of biscuit flavour in the background. The drink was pleasant enough but didn't quite have the wow flavour I had hoped for, I wanted more Oreo. 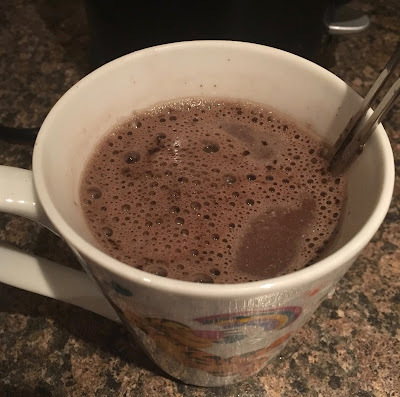 The second mug of Oreo hot chocolate was for my mum. She sipped it, said it was nice but not very strong in flavour and that perhaps next time I should add an extra spoon of powder. That may well improve the flavour, but that jar isn’t going to last very long. Last week I went to Nisa and got some Milkshakes to supplement my lunches. We looked at the lactose free Ufit then - but here we go for the macho option. I'm really not sure why this brand has caught my attention so much, but I guess as one of the featured ones in Holland & Barrett I was bound to try it eventually. All the shakers and supplements are prohibitively expensive (its pretty much the top end of H&B's male supplement range) so I was glad to find this with only an extra 49p compared to the almost identical Ufit shakes. As you'd expect its a bottle of UHT milk with some stuff added, but it has grenades and killa on the bottle so it must be better than the standard girly shakes. And in fairness they know their market - that vague substance Protein (that the human body has to break down before it can use) is here in abundance but none of the calories or carbs. I mean you could just eat vegetables and get the same effect, but you can't pretend to be in a war as easily then. In fairness though the shake is good, the minty chocolate flavour is good quality and like the UFit I'm 100% sure that joking aside this is better for you than the non science milkshakes are. The extra niceness may actually justify the extra 49p too, but as there was only one flavour of this I'd be more likely to get a mix if it was to become a regular thing. I didn't get a picture of the ingredients so I can't compare the fortified vitamins and minerals, but as the focal point here was protein I'll guess it's similar to the UFit ones and check if I still have the bottle at work. £2.50 for something that is the same size as a 50p can of pop is always a hard sell, but if you find yourself in need of some 'Protein' and the shop has no actual sources of readily available amino acids (that your body will then convert into the proteins it uses) then go for it. There are a lot worse tasting options out there. I've recently re-watched some of the old Peter Seller's Pink Panther films and was pleasantly surprised at how funny they are. I couldn't remember much about them, as I hadn't seem them in so many years, but that kind of slapstick humour does tickle me. No Pink Panther with this porter, purple is the colour of mystery and this Purple Panther has oodles of that. I picked this bottle up from a Lidl some time ago whilst we were driving back from a holiday somewhere. I know that sounds vague, but I have no idea how long this bottle has been in my beer cooler. Yes, I have a beer cooler in the kitchen. It was left by the last people who lived here, so thank you very much :-) Cinabar tries to fill the beer colour with other stuff, but it generally doesn't last very long in there. I like my beer cold and refreshing, and not too crowded. At 5% volume and produced by Hatherwood Craft Beer Company, this Purple Panther is an enigma. Why Purple Panther? Why not Black Panther, as they usually are that colour!? Besides the purple looks more black in the bottle. The label describes dominant coffee bitterness in the Purple Panther's rich smooth flavour, with hints of toffee from the speciality sugar the brewer used in their secret ingredients for this "smoky malted porter". On opening there was that familiar dark fruity porter smell with a hint of coffee and sweetness. I can see where the 'panther' name for this porter came from. It's almost jet black. On taste there is a definite dominance of coffee to the roasted malts mixed with the complementary bitter hops, followed by the smoky toffee sweetness the label describes that flows like a mysterious dark rich river over my tastebuds. This is an expertly crafted porter from a shop I rarely have chance to go into, and it's full of pretty decent stuff too! I was in the supermarket looking at tea, when I had the realisation that the huge box of Yorkshire Tea Gold was cheaper than buying two of the smaller special offer priced boxes sat next to them, even though it amounted to the same number of bags, and itself wasn’t on offer. Mental arithmetic and the search for a bargain went a little out of the window when I also added to the trolley this strange sounding box of Yorkshire Tea Biscuit Brew, just because I wasn’t sure what it was. Once home I gave the Biscuit Brew a closer look. 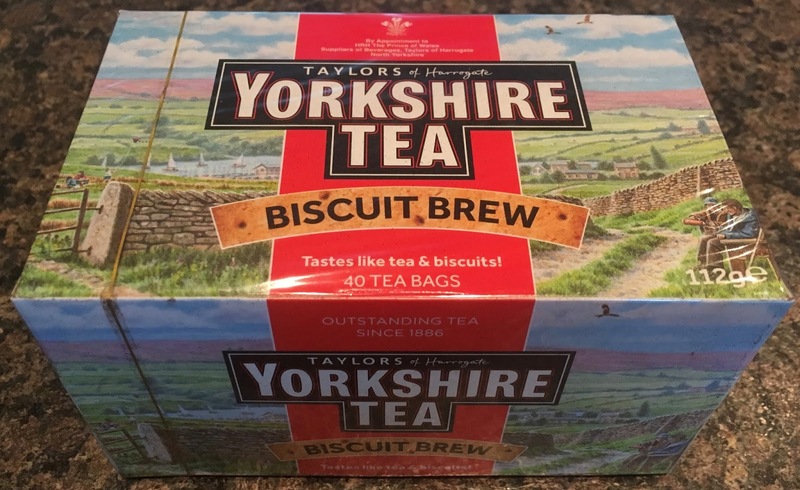 I thought it may have been a tea specially designed for the dunking of biscuits, but as it turned out it wasn’t, it is a tea flavoured with biscuit. Really. I immediately checked the ingredients on the back of the box and the saving grace was the the extra flavourings were all natural at least. I put the kettle on. When brewed this Biscuit Brew tea had a sweet smell, but there was still plenty of proper tea aroma too. The flavour was surprisingly cake like. It reminded me mostly of a vanilla sponge and tea, but all in liquid form. I thought it was sponge like because of the sweet buttery taste, but I guess I could be persuaded it was a shortbread flavour too. 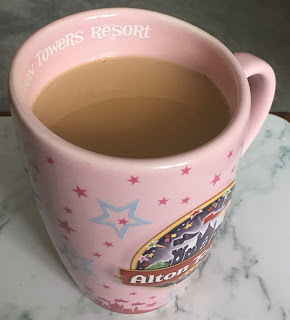 My initial sip made me think the Yorkshire Tea Biscuit Brew was a bit weird, but by the end of the mug I decided I liked the tea, and that over all I think the flavour worked. It was a soothing drink, and essentially adding vanilla and cream just gave the drink a luxury feel. It might not be the tea I go to first thing in a morning, I think its place is a warming cup in an afternoon, ideally with a biscuit ready for dunking. I popped to Nisa for a healthy lunch, and failing to find one picked up some milkshakes. I mean - I'd have probably got a big tub of olives or something equally marginal from Tesco, but at least there would be more choice. There were a couple of interesting ones in the bad science section of the fridge, but today lets look at the UFit lactose free. Essentially they stick some enzymes in the normal milkshake, but it has the added advantage of been a nice vanilla flavour too. Looks and tastes like a decent vanilla milkshake. It does contain a few of the things I'd be considering supplementing in such as D3 so it's certainly not a terrible waste of time. I'm not sure that the amounts present will turn your life around though, and certainly eating some green things would be a better idea. Compared to other milk and water (and oil!) drinks though it's not too shabby. Not something I'd encourage people to live off, but (as I used to use this brand after swimming) a nice treat that will make you feel a little bit better than the big bag of crisps does. At last the rains have come back and there is a bit of a chill in the air. 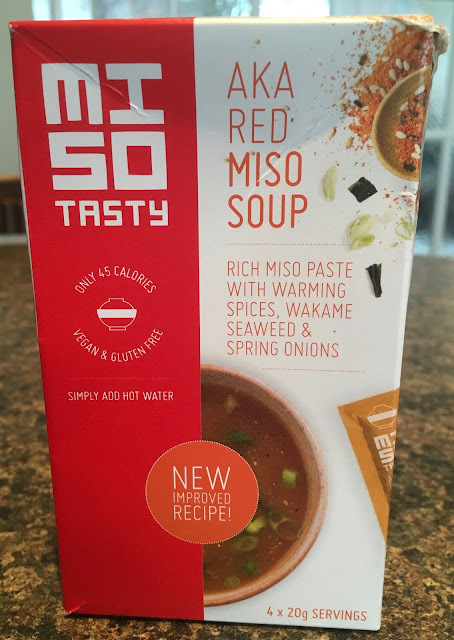 To warm my bones this morning I’ve decided to try this Red Aka Miso Soup, produced by Miso Tasty. 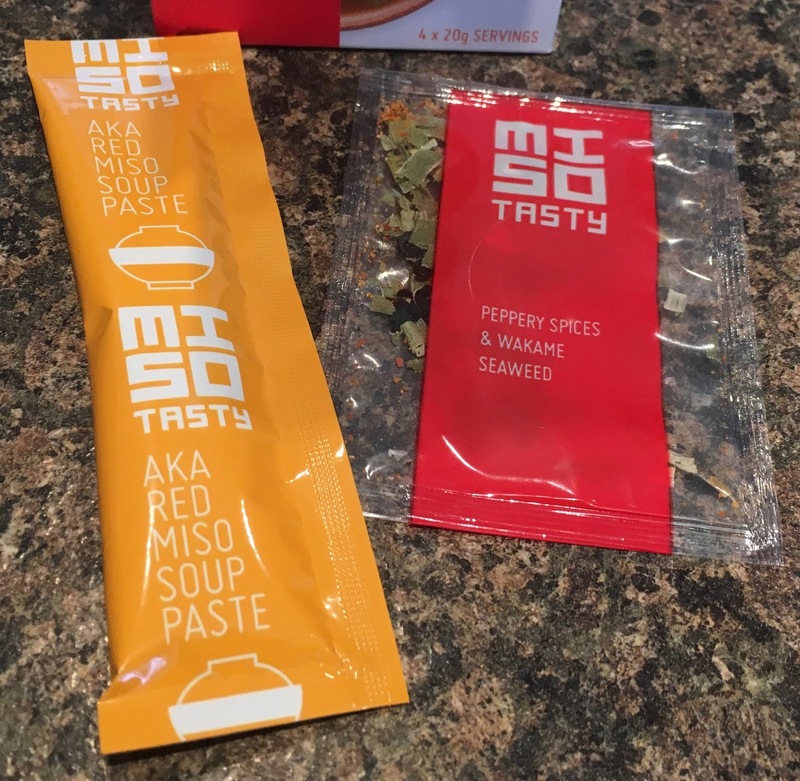 Thoughts of quotes from the movie Full Metal Jacket™ asides where the manufacturer’s name is concerned; reading the box this Aka Miso soup is popular in Hokkaido and northern parts of Honshu, in Japan. So I prepared my trusty work mug (wiping the tea stains out a bit) and boiled the old works kettle. I usually use the dirty great boiler for tea, but that seemed wrong for this somehow. After squeezing out the gooey orange coloured contents of the yellow sachet of Miso soup paste, and shaking out the Wakame seaweed and diced spring onions into the bottom of my work mug, I added freshly boiled water and stirred for a short time. 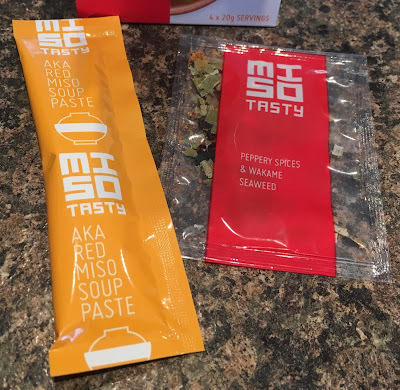 The contents had the consistency I’m used to of a regular Miso soup, whilst being slightly reddish in colour instead of the usual off-green. On taste this Aka Red tastes like a rich Miso soup. Of course there’s the seaweed and spring onions dominating the flavour, but there’s also the warming spices underneath brushing up against that traditional Miso soup taste. This is a really tasty healthy feeling soup. I couldn’t fault it in a mug, asides drinking it made me slightly worried I’d choke on some of the seaweed and spring onion pieces. I’d recommend a spoon and some bread for dipping. Otherwise, just as good as any restaurant Miso soup I’ve tasted in restaurants... In fact in some cases, even better! 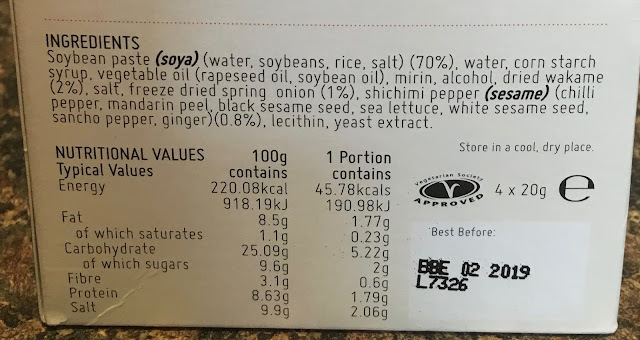 The box consists of 4 x 20g servings, each with 45.78 calories (very precise), 1.77g of fat, 2g of sugar, and 2.06g of salt. Rich in protein and antioxidants, and with vitamin K and B12, see photograph for ingredients. Well my home town of Wolverhampton has recently opened a Krispy Kreme outlet in the city centre. I couldn’t resist having a look and seeing if there was anything new that I could use as an excuse to make a purchase. 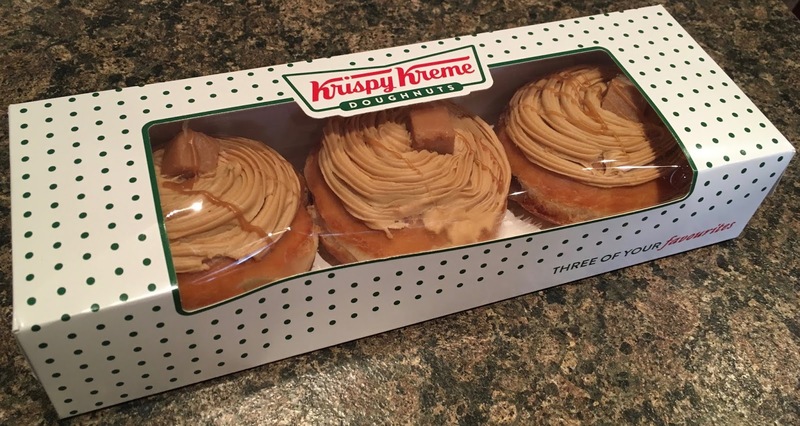 I was in luck because it seems Krispy Kreme are embracing caramel as this season’s flavour, they have this New Caramel Swirl Doughnut and a caramel glazed original doughnut too. This one was by far the most interesting looking out of the two, so I treated us to a box of them. 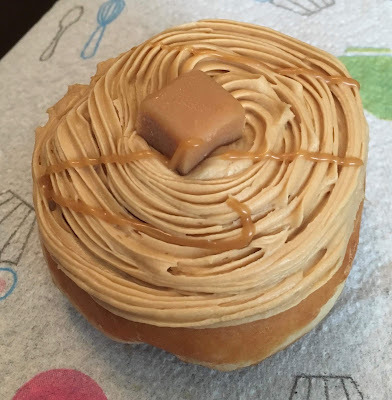 The Caramel Swirl Doughnut from Krispy Kreme really does sound like a caramel overload. The doughnut is filled with caramel, topped with caramel frosting, which is drizzled with caramel sauce and just for good measure topped with a cube of caramel. I started with the caramel cube on top and picked it off, and it had a soft non-sticky texture, that was lovely and sweet. I then bit into the doughnut itself and it was a proper caramel treat. The frosting was divine, sweet and rich, and the caramel drizzle emphasised this. The liquid caramel filling was wonderfully sugary, and had hints of butterscotch. The whole doughnut was a caramel lovers dream, sweet, rich and spot on. It also looked rather pretty and was fully loaded with caramel flavour. I’m really pleased Krispy Kreme have opened in Wolverhampton, and I will be back there next time I need a sweet treat, or indeed when they launch the next new doughnut. New flavours of Pringles can be quite adventurous, and often quite spicy. These new Pringles have been brought out for Festival season and come in a bright coloured tube that is very eye catching. 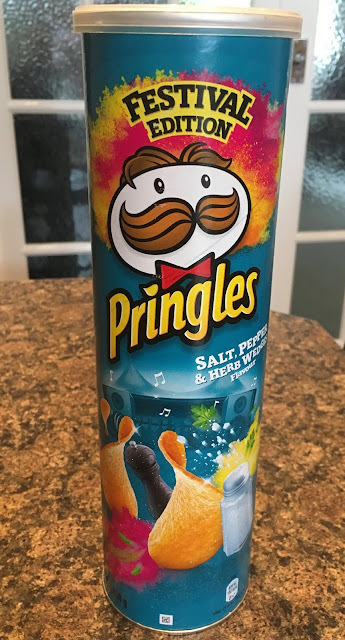 The flavour didn’t seem that exciting to me, it is titled Pringles Festival Edition Salt, Pepper and Herb Wedges Flavour, but essentially sounded like salt, pepper and herbs seasoning. What I’m trying to say ifs for such a bright and fun time of year and with the pretty packaging the actual flavour sounded like a bit of an anti-climax. I don’t have any plans to attend festivals this year so had these with lunch, not quite the same as munching these in a tent on a muddy field with loud music, but I’m sure the setting doesn’t affect the flavour. I gave one a try and realised immediately I had underestimated these new Pringles Festival Edition crisps, they were absolutely full of flavour. The seasoning was quite strong and I think I could pick up on Italian herbs and rosemary, there was nice twist of onion too and the salt and pepper enhanced all these flavours. The taste was quite strong, but in a good way. I had my first one and the Pringles moreish magic kicked in and I couldn’t stop munching. I may have underestimated these crisps, as these are a special edition I will miss them when they go, never mind festivals, these are the perfect tub to pack into any picnic basket, or just to share in front of the TV. One of the great things about Ocado learning who you are and what you like is that it makes decent suggestions. They know I buy almond milk, so they suggest other things that aren't milk, but also kind of are. Here we have MYLK which is vegan/dairy free yet is a thick gloopy white thing that you use to make cereal edible and can put in drinks. So far so good with the bran flakes. It's a bit frothy because I shook it a little too much. You really don't want to see the cup of tea where I didn't shake it at all. As it's got coconut milk in there too - that also tasted bad. Some things don't go well with tea. It has Himalayan salt for hipsterness - you aren't fooling anyone Mylk. Otherwise it's a great blend of flavours for non-tea applications. I must try the next one in coffee. And yeah - I'd actually consider using this in baking due to the texture/flavour combo - I think it'd do well. But we know how good I am at getting around to baking so I'll just stick to adding one of these to each Ocado order and having some lovely creamy cereals without all that dairy nonsense.